Finally, after all that drama (including a very cool divine appointment where a young man asked me to lead him to Christ), I finally met my new unit – the 1-121 IN (infantry) BN (Battalion). I’ve never worked closely with an IN BN before and in some ways it’s everything I’ve heard of but in a lot of ways it’s not. 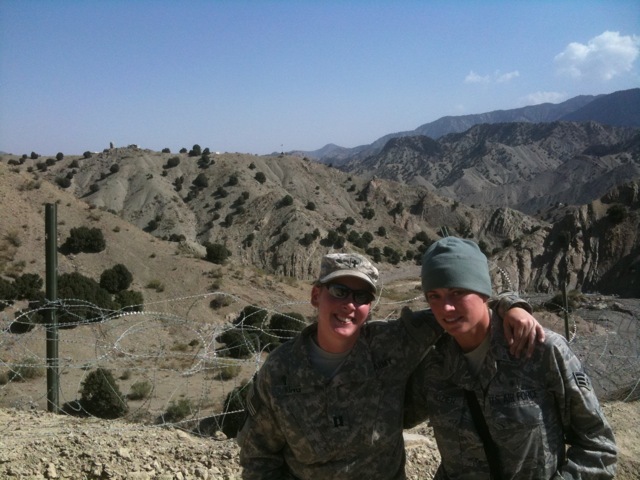 It’s very unusual as a female to assigned to an IN unit as they are one of the few still exclusively male units. I think I got the assignment in large part because the unit’s located on a JTF (joint task force) post which has folks from every branch of service (except Coast Guard – sorry my Guardian/Coastie brethren) and there were already 2 other male chaplains assigned to the unit. It seems like a strange set up to me, hey, who am I to blow against the wind? If I get the group of folks I will be working with consistently, I’m happy. So, the first 2 weeks were basically ‘get acclimated’ to FOB (forward operating bases- wartime posts) Lightning in Gardez (Norther, and East near the Pakistan border)– in some ways, literally – I’m now at 7,800ft in altitude (and yes, my run time immediately tanked…again…*sigh* but I can look forward to being AMAZING when I get back to 1 mile high!). I have found that most of the camp services are lay led which leaves me time to do sermon prep and do ministry of presence – a luxury I never felt I had enough of in Kuwait. It’s also freed up some reading time – I’m reading several things right now: Afghanistan by Rasheed (painfully dry in places, but incredible informative); Grace in Practice by Zahl (I can’t say I’m really enjoing this…I am finding it strangely graceless in it’s systemization); Surprised by Hope, Write(INFINITY valuable stuff as I minister to and with folks who have to live out their theology of the resurrection every day) and Tuesdays with Morrie by Ablom…interesting stuff. I’ve also begun to join my fellow chaplains in rotating out to visit other FOBs and I am currently at Camp Clark – a lovely (really, it’s very nice) little post that is very well laid out and organized. This is very different from the ministry I was doing in KU, so in a lot of ways I am re-learning my job; difficult for me right now. In many ways, this has been a great adventure and I’ve really enjoyed some of the stuff I’ve been privilidged to be a part of. In other ways, this has been an incredibly lonely time for me personally. I find I miss my friends and family very much – the first time for this deployment – and I’m finding the culture shock exceptionally difficult to breach this time. In many ways, it is difficult for me as a single woman to minister here, both because the AF people are so segregated from women, they just don’t know what to do with us when they see/meet us – they are either way too forward or mean…I’m grateful that I can’t understand what many of them have said to me in passing… so, that’s complex. Then there’s just the normal difficulties of getting to know a new group and find one’s place/voice. The Lord blessed me w/ my first 3 week sermon series – I did it on faith, hope and love; topics the Lord has been hammering me with lately. All told, this is a phenomenal place and opportunity for ministry, but one must look for it and stay engaged when everything around you cries for disengagement (a survival tactic). I lead my first bible study out here tonight. 3 guys came. We talked about Mat 8 and the storms of Life and where Jesus is when we cry out to him in our terror…the guys really loved it. Jesus is answering our prayers in the mist of our storm of war. Friends, I am tired. Not of people or even ministry (which is life affirming – I have not slid back into burnout/compassion fatigue) but of transitions. I realize I left my home in Denver CO on 18 JUN 2008 and have only been home 25 days in the time since… I’ve never been overseas this long and while it is my hearts home, I am finding I long for time to pull back and re-evaluate all that I’ve been through. To this end, I’m pretty sure I’m going to take a job offer to help train the next generation of MOB (mobilizing) soldiers at FT Hood in TX for the next year. This will help me ‘pay back’ my owed time to the Reserves before going active duty and it will also give me a guaranteed year in the states; time to rest, refresh and restore. I would appreciate your prayers for my last 2 months here in country – I unexpectedly found out I need to be home and ‘deMOBed’ just before Christmas, which will mean I have to start my great migration around the 1st of DEC. Please pray I am able to pour out all of my love and compassion on the men and women I am surrounded by; pray I am not timid at all. Please pray for my transition home…this will be complex for me for a variety of reasons. Please pray for my troopers – they/we really are in harm’s way every day. In the desert there is a life most unusual and stunning… as in many harsh environments (be it because of economics or environment) what quickly becomes important are your relationships – you simply cannot ever afford to have enemies in your neighbors – you must make amends if you offend. You must. Your life and livelihood depend on it. This place is no different in spite of become a 1st world nation over night due to the oil; folks still spend months of their years out in tents in the desert so they won’t forget – they spend their nights in fellowship with one another over tea, coffee, hookah, and (as my Hawaiians would say) ‘talking story.’ What is beautiful here is often not what you see with the naked eye – the desert stretches on forever with very little interrupting it except for a town or power lines – what is beautiful is a soul – how one listens, the attention one gives to their host and visa versa. The quality of the interaction and even (I think) to some degree the quantity of the interaction – how much raw time is one willing to give to a friendship or new relationship? It makes me feel both anxious and inspired. My heart is full as I go on to my next assignment. God has grown, matured and inspired me here. The death I felt as I left RI has been healed and the roots and been addressed and given over (even here more roots were taken). I have several new dear friends, one in particular has become very close and dear to my heart…so many unexpected gifts…There was a vision I had in Africa a few years ago where God was standing with joyful glee and filling my arms with gifts and he had more he wanted to give, but my arms were so full, there was no way to even balance one more, so it would have to wait. And wait it has – when I came here my arms were finally empty and open. He has placed extravagance in my arms once more…hallelujah!! This can be a very daunting task writing the monthly updates. For me, time is a fickle thing – moving faster than can be borne some days and so slow I wonder if I’m in trouble for missing something… but none the less, I enjoy writing them as it gives me an impromptu opportunity to ‘download’ some the events of the month. I’ve been feeling better about my schedule lately – I sort of had an emotional, internal ‘crash and burn’ last month when the pressures of going almost non-stop for 6 months caught up with me after a particular vicious string of weeks without a full day off. It was very disturbing because the last time I did this was when I was on staff with IV and I just felt that that was catastrophic – it took going away for 3 years to seminary to get repair the damage I had caused then. So when I was feeling that depleted again and so quickly – it was very depressing and I spent a few weeks feeling rather depressed. Now, here’s where the new tools and plans I got in seminary paid off. I’ve been meeting with my Spiritual Director in the states on the phone weekly and she’s been an enormous help and encouragement. Also, when the Lord did present me with a series of days where there was not much going on, so I took advantage of the lull and crashed – just laid low for a few days. Normally I feel very guilty about not being at work when I think I should be. But I had an epiphany that week – I realized I’m working every conscious hour I’m awake – my command has mandated I’m only supposed to be working 8-10hr days (it’s been more like 12-14hr days for me) – so I realized I didn’t need to be coming in at 0830 every morning and staying until 9 or 10 at night. I could come in later on those days I know will be late and I can work out in the morning instead. This was hugely freeing for me and it’s helped me develop a better work rhythm here. Counseling continues to be a heavy load, though I have found it’s dropped of significantly now that we’re well past the holidays. I don’t know if I mentioned it before, but I’ve been blessed to have a new Navy E6 (MA1 –for those who understand that!) join my UMT (unit ministry team – me and Sanders). It was really difficult having my assist away on block leave for most of FEB, but Chappell (yes, that really is his name) really made it not only bearable, but also doable- between him and a ‘loaner’ from the unit, we actually not only kept the boat afloat, but got some critical supply issues resolved. But I was VERY glad to have Sanders back. I am shocked to realize I can actually keep several assistant employed at any one given time; this was also an epiphany to realize I’m working to much. I am enormously looking forward to coming home for my block leave in June. I am in the final stages of preparing my paper for my final ordination interview. God willing, I should be ordained in Portland on my block leave. The Lord is faithful – he told me when I was 17 he would make me a pastor and that it wouldn’t be until I was in my mid thirties – I’m 35 and schedule to be ordained in June…God is good. I’ve been thinking about time lately. We spend so much time wishing the time would pass quickly here. We’re basically locked down much of the time here on post, so there can be an oppressive feel to how time runs here. But I’ve been thinking about it – I can never get this year back. If I spend the whole time wishing I were somewhere else or that the time would just hurry up and get on with it – what will I be missing in the here and now? What work of God, beauty of nature or wonder in the growth of a human being (me or someone else) will or even am I missing out on? The need to speed things up must never subjugate the need to be as fully present to the wonder of the moment. Another thing – I’ve struggled for years in a mild sort of way wondering if I am more of a leader or a shepherd. Well, since I’ve been here I’ve seen a number of people come and go. Recently, I’ve had occasion to see 2 sailors I became very fond of visit our camp for just a few weeks, then go – I was not sure I’d see them again and was sad at their leaving. In the last 2 weeks I’ve had occasion to have them both back for a few days each and it was a joy to see them and minister with them again. I think this settles the debate – I am a shepherd more than a leader (in the sense that a leader looks more at the big picture and is not necessarily concerned with WHO is performing what function so much as what function needs to be performed and what quality/kinds of people he or she has to do them). Finally – we’ve begun wrapping up things here (I know, it feel early – but you try to coordinate and move several hundred people and equipment internationally and see how long it takes you!) – awards are beginning to be processed, promotions granted, projects looking to their completion. I’ve been writing Sander’s award recommendation and I’ve been asked to submit my to 5 things I’m most proud of. It was a little embarrassing once I’d written it, but fun nonetheless. So, I’ll end by sharing my list with y’all – after all, you’ve been supporting me to do it! - Trainings (as of 3/09): co-conducted 6 Strong Bonds classes (marriage and relational wellness classes); trained the trainers and assisted in 8 suicide prevention classes (Beyond the Front); assisted in 6 Newcomers Welcome Briefings; and attended 5 UMT trainings by ASG-KU chaplains. - Conducted (current and projected): 32 Sunday morning worship services; 32 Bible Studies; 20 Praise and Worship Nights; 8 special Holiday services; 5 Movie and a Message events; 5 invocations; 3 hospital visitations; and 45 guitar/music lessons. Provided for the needs of Muslim, LDS and Jewish SMs throughout the deployment by driving them to events, coordinating regular access to services and providing materials (books, prayer rugs, etc.) as requested. - Counseling (as of 3/09): 24 Red Cross messages; 23 Duty calls; 136 counseling sessions of varying types. - Improved Chapel supplies and equipment (current and projected): ordered: ACU Bibles; Scholars and Pastor’s electronic libraries for the Chapel (there were NO pastoral reference materials here before); crosses, medals, stars of David, Muslim Chaplain Field Kit; 2 new microphones; I personally serviced and made useable 4 guitars that were in storage; and facilitated and coordinated with the Fire Department to get the Chapel up to current fire code. Hard to believe yet another month has passed us by – lent is fast upon us and I prepare for yet another round of ‘firsts’ for the holidays. It’s been another month of great blessings and great trials. We were blessed to have an evangelist Chaplain out visiting from Virginia last week. He’s the rear-detachment chaplain for the group here and was out to do a sort visit to catch up with his folks. He’s a very fervent and warm hearted brother in the Lord and it was a blessing to have him out for the week. I saw him led at least one person to the Lord! (Pic = I got to go for a ride on an LCAC (hovercraf)- I know, I look a little punchy; the other was a camel ride sponsored by the MWR (rec center)). I was also blessed to tag along with him to downtown Kuwait city to meet some of the local protestant pastors there – what a blessing to be in the middle of brothers and sisters from all over the world worshiping God together in several different languages – this always impresses me as a foretaste of heaven! I also got to led a small group of 26 out to KU city to the Catholic Cathedral. It was a rich time of fellowship and worship for my Catholic community and I was blessed to fellowship with them. I’ve been enjoying several good books lately: The Ragamuffin Gospel by Brennan Manning and Surprised by Hope by NT Write – these are helping to continue to shape my pastoral identity and thinking – good stuff if you get the time! A good friend recently pointed out that I am in a very similar situation to when I was on IV staff just before I left – I am the sole minister to a campus of several hundred souls. And I find I need to fight to keep another chaplain preaching here on a regular basis for our Sunday evening service. She reminded me that growth is always painful but it is something we greatly desire. I’ve been meditating on that the last day or so and while I acknowledge the truth of it, I confess I still don’t like it when I’m in a growing season. She also suggested that God is redeeming some of the negative lessons I learned during my time on staff and giving me a new experience of Him in the middle of what looks like the same situation. I find each week as I prepare to preach I go though a series of anxieties over it, but each week God shows up and an aspect of His Kingdom is revealed, people hear God’s word and lives are touched. And I’m pleased to report I think I have very little to do with it. This has been going on for months now and each week I don’t die, God is actually glorified and the community grows. I hope and pray I am beginning to trust the Lord a little bit more with my life and heart as I publicly declare the goodness of God in the land of the living. I just hope I can learn this sufficiently well so God can return me to the team-based ministry that I love so deeply. Hi Gang – hope the holidays were terrific for you! I am doing well here. The weather turned sharply on New Year’s Day – it was a cold, windy and rainy day. It has since gotten a little warmer, but I am beginning to wear my fall weather gear fairly regularly. It still remains sunny and bright during the days and I have no fear of snow (sorry my CO & RI contingents!). I am pleased to report on the friend-front that I do have a couple of good friend possibilities and I am hopeful to see how the Lord will develop these relationships. One of my new friends even came out to KNB from another camp and kept me company for the entire Christmas Eve/Christmas Day services cycle – I felt sooo supported by the Lord through her friendship! Now that the holidays are behind us, I feel the mood in the camp lightening some. 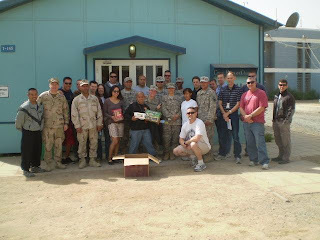 Christmas time in a deployed setting was incredibly difficult for most of my soldiers and sailors. Thank you for your prayers for us during that season; it made a HUGE difference. - God would continue to fill me with his confidence and presence as I preach and teach each week. Greetings from sunny Kuwait! I hope each of you is keeping very well during this Christmas season! May the light of Christ dwell richly in you as we wait together! Things here are going well, I think. I’m settling into a weekly routine of sorts where I have meetings, hold services, counsel soldiers do visitation. There is a sense of security that I get from having a routine, but it’s a double edged sword most of the time – on the one hand, I like knowing what I’m doing on a consistent basis, but on the other, I get board very quickly and the routine can grate on me. The holidays in a military (I say ‘military’ because we’re Army, Navy and Marines) camp are a strange thing. On the one hand folks are not generally in the festive mood. They feel most keenly the absence of family, friends and holiday traditions at home. And unfortunately, we’ve arrived at just the time of year to catch all the holidays during our stay. So, this is where I see my role as a priest of God and how God has made me intersect with this group. I don’t generally love the holidays when I’m at home. I love being single all the rest of the year, except at the holidays – then it becomes very difficult for me. However, here everyone is feeling like a fish out of water, so –strangely- I don’t feel that way; I love the holidays here! And it enables me to speak words of encouragement, peace and hope into this community. And that is such an encouragement to me, too. On the friend front, this continues to be a struggle, but the Lord has provided a few tentative life-lines. I feel like I’ve learned so much about starting a new life from my move to Denver and these lessons are paying off now. I know the Lord has friends for me here, but it takes time to find them and who I start off with may not be who I end up with. So, patience is again the watch-word. It is also complicated making friends here as I am the post chaplain, so it requires someone of fairly significant maturity to be able to see me as a human and a pastor and not have a melt down about either. I have one real possibility for a friend, but she just got moved to another camp, so I’m not sure if we’ll be able to stay in touch. This is a pretty serious need I have, so if y’all could pray for that, I’d sure appreciate it. Right now my major source of support are my fantastic friends back in Denver (I’m SO grateful for y’all!!! ), but obviously, I need some fellowship here as well. Well, thanks for hanging in on this Christmas ramble…do stay in touch – I’m on em regularly at tkin5787@hotmail.com or terri.king1@us.army.mil.